Home > Animal Fence Kits With Posts, Hardware & Accessories > COMPARE DEER FENCE KITS & FENCING - What do I need? A deer fence kit is a selection of fencing, fence posts, accessories and hardware to build a complete deer fence starting from nothing. These type of fences are designed to keep out or contain deer & elk. There are 1000+ fence kits, combinations and options within each fence kit. The purpose of this page is to help you compare the choices to best select the deer fence kit or parts you need. Deer fence information: How high does a deer fence need to be? What is a deer fencing? Please click here for frequently asked questions. This is the most popular type of deer fence. These kits consist of poly deer fencing (in all different heights and strengths) matched with some smaller opening size steel fencing (in different heights, strengths and opening sizes). The purpose of these fence kits is to not only exclude large animals like deer (poly fence is great for deer) but also small animals like rabbits, groundhogs, snakes, etc. These deer fence kits include extra fencing to overlap on top of the ground and to attach to the ground with included ground stakes. This covers changes in grade, peaks and valleys in your landscape - which is very important when keeping out animals. These kits also make it very easy to have a nice looking finished product; the top fencing gets installed at the top of each post while the bottom fencing takes up all the changes along the ground. The seam between the two types of fencing can be done with included fence ties or by the addition of a hogringer hand tool and hogrings found here: hogringer hand tools - Suggested: the hogringer 11/16 with 500 included hogrings for small fences and hogringer 9/16 with 2500 hogrings separately for medium to large fences (above 500 linear feet). The 9/16 hogringer is easier and faster for taller fences. This is the most popular type of deer fence kit for customers that do not care about keeping out small chewing animals. They are designed to contain or exclude medium to large animals like deer but do not include a rodent barrier or chew barrier bottom. These kits include extra fencing to overlap on top of the ground and to attach to the ground with included ground stakes. This covers changes in grade, peaks and valleys in your landscape. This prevents deer from being able to push up under a fence for access. Some aggressive deer will lie down on their sides and try and slide under a fence. These kits also make it very easy to have a nice looking finished product; the top fencing gets installed at the top of each post while the bottom fencing takes up all the changes along the ground. 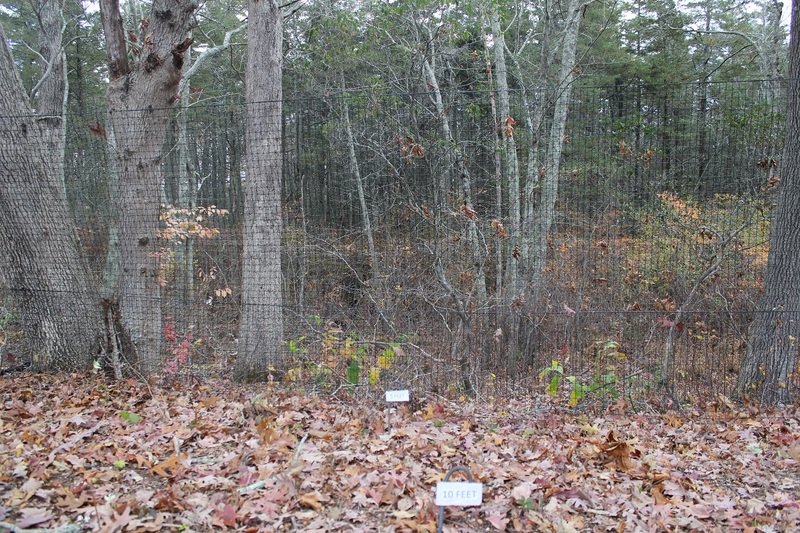 A good example of where you would use this type of deer fence is around an orchard where rabbits aren't a concern. These fence kits don't include a rodent barrier and don't overlap on the ground. That means for example if you order a 8 foot fence kit, we will ship you posts that come out of the ground 8 feet and 8 tall deer fence to be hung on those posts. This configuration is great for customers protecting arborvitae or other shrubs, for example. It's also a great choice for customers that need to take down their fence seasonally or for a removable deer fence. Our post sleeve system includes locking set screws which hold our deer fence posts in the ground. Ground sleeves stay in the ground, while posts and fencing are removed for storage. Optional post sleeve caps can be used to cover ground sleeves when not in use. These are specially designed fence kits that include protection against climbing animals (keeps animas in, keeps animals out or keeps animals both ways in and out). The posts in these kits include extensions on the top of each post; when paired with included fencing, these extensions make an overhead canopy that animals can't climb over. These kits can include overlap on the ground and also a rodent barrier. They are most often used by customers that want to keep their cats in and other animals out but are also used for keeping out raccoons and coyotes. These deer fence kits consist of all 1" opening size or smaller fencing and are engineered to exclude most animals including birds. These kits are great for customers that want to grow anything that is normally eaten by birds, such as berries, or climbing animals like raccoons. These fence kits are specific in size and can cover smaller areas because of their modular design. Have a shorter fence you would like to extend up higher? These fence kits make it easy to convert your existing conventional fence to an effective deer fence. For example, extensions to increase the height of your chain link fence, wood fence, aluminum fence to deer proof your yard.